This is an ideal opportunity for 2 or three families to holiday together in two beautiful villas, Villa Fara and Villa Krisana, next door to each other. Each villa is identical in model and size. The gardens are connected with a walkway, to allow children to move freely between them. 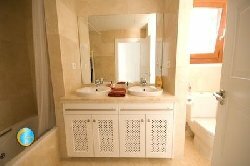 Villa Krisana is a stunning three bedroom beautifully furnished spacious villa. It has it's own swimming pool, views onto the mountains in the backdrop and a lovely established garden with a good sized area laid to lawn. Well catered for outdoor eating and relaxing with seating and dining areas on the Patio by the pool. The villa also has a superb sun room with dining/seating area and BBQ. This can be opened in the summer or closed up for cozy winter evenings. Villa Krisana sleeps 6/7 people, with large spacious terraces as well as a private garden and a swimming pool (20ft by 11ft approx). There are 3 twin bedrooms, one ensuite, and a further foldaway bed that can fit into the bedrooms. The main ensuite bedroom beds can be pushed together to form a double bed, with double bed linen provided. Lounge to dining room - an L shaped room - approx 28' x 24' at its widest narrowing to 14' x 12' 5" at the dining end, as well as outside covered eating area of 18'. Second bedroom 12' 6" x 10' 6" third bedroom 13' x 11' 6"" There is a shower room with large walk-in shower plus basin WC & bidet. The Villa has a spacious feel with bedrooms off long corridor and the lounge/dining room has a high vaulted beamed ceiling. All accommodation is on one floor i.e bungalow style. There is an outside covered eating/sitting area some 18' in length. The TV is 32" flat screen chosen to suit the lounge area & not dominate it. There is also a JVC DVD player and Hi Fi system with connection for Ipod & memory card and satellite. There is also a selection of DVD's and board games etc..
All linen and towels are provided as well as garden furniture and 4 sun loungers. A travel cot and highchair are available free of charge. Villa Fara sleeps 8 people with a double leather sofa bed in the lounge (suitable for two children only), TV and DVD, and large spacious terraces as well as a private garden and a swimming pool. 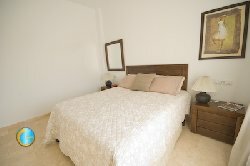 There are 3 bedrooms, all twins, with the master ensuite bedroom having twin beds that can be pushed together with king-size bed linen available. A single foldaway bed is also available. The master bedroom has a 20" flat screen TV. The TV is a 32" flat screen chosen to suit the lounge area & not dominate it. There is also a JVC DVD player and a new Hi Fi system with connection for Ipod & memory card and satellite TV. 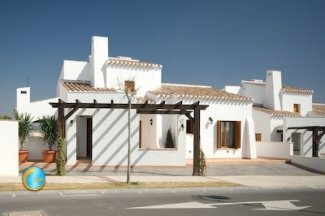 The Polaris World Resorts are built to a very high standard, not often seen in Spain. The villa is set amongst landscaped gardens with shrubs and trees with large areas of grass, with fantastic views of the Mountains of El Valle (from the rear), yet only a 20 minute drive from the beeches of San Javier and Los Alcazares. All linen and towels are provided (not beach or pool towels) as well as garden furniture (4 sun loungers, 6 large garden chairs and table). A high chair and cot are availAble free of charge. El Valle resort and its luxurious villas and apartments are a wonderful place to holiday with family and friends. The most peaceful and exclusive of the Polaris resorts all offering top class golf. The resort has a restaurant, bar with a large outdoor eating patio overlooking the course. There is a supermarket, gym.